This Unstuffed Pepper Bake features the classic ingredients of stuffed peppers, but in casserole form. Jam-packed with ground beef, green peppers, rice, and spices, this dish take just 30 minutes from start to finish! Now that the weather is getting cooler and fall is officially in the air, I’m craving a lot of comfort food. Foods that are hearty and fill my house with a delicious aroma makes me appreciate the season even more. Knowing that the air is crisp, the leaves are changing, and I have a hot meal just waiting to be devoured signifies fall and all things deliciousness. Although I do most of the cooking, the hubster often helps me and has a few signature dishes of his own. And one of those dishes just happens to be stuffed peppers. He has an old recipe, faded from use, and will make this dish once or twice a year. I love when he makes stuffed peppers because not only is it delicious, but it also gets me out of the kitchen. And I do like taking a break every now and then. So when we were going over our meal plan a few weeks ago, I had the idea to take the hubster’s famous stuffed peppers and turn it into a casserole. Instead of baking the mixture inside green peppers, I wanted to make it all-in-one. And that’s where this Unstuffed Pepper Bake came from. This Unstuffed Pepper Bake features the classic ingredients of stuffed peppers, but in casserole form. Jam-packed with ground beef, green peppers, rice, and spices, this dish take just 30 minutes from start to finish. It makes the perfect weeknight meal and is sure to cure your comfort food cravings. It’s also the second recipe in a series of 30 minute meals that I’m sharing with you on the first Thursday of every month, along with some of my other blogging friends! If you’re looking for an easy dish that’s a breeze to whip up, then this Unstuffed Pepper Bake was made for you. Did I mention that it’s ready in just 30 minutes? And that includes the prep time, too. Which means that you can have this hearty and flavorful dish ready to devour in no time. And the prep work couldn’t get any easier! Simply brown some ground beef and toss with green peppers and onions. Then add some marinara sauce, white rice, and cheese. Mix everything together and pop in into a casserole dish. Top the mixture with some bread crumbs and bake until browned and warmed through. And that’s it! This Unstuffed Pepper Bake is filled with warm flavors and hearty ingredients. It makes the perfect dinner and even works well for leftovers. And that’s a winner in my book. So if you’re looking for an easy meal, skip the stuffed peppers and try this Unstuffed Pepper Bake instead. It contains the classic ingredients, but takes less time to prepare. And trust me, this will be a new meal-time favorite in your house! Preheat oven to 350F. Prepare rice according to packaged directions. In a large skillet, add ground beef, green peppers, and onion. Cook over medium heat until beef is no longer pink. Drain mixture and return to skillet. Add in rice, marinara sauce, Italian seasoning, garlic powder, and cheese. In a small bowl, combine bread crumbs and olive oil. Sprinkle bread crumbs over top of ground beef mixture. Bake for 8-10 minutes, or until heated through and bread crumbs are golden. That's so funny! I just made stuffed peppers the other day. I love them, but your way is much faster and doesn't involve coring a pepper. Yay! Great minds think alike! :) This is a nice option for when you want a fast meal! Oh I love this Gayle! The filling is always my favorite part of stuffed peppers, so this is just perfect. Even better that it only takes 30 minutes! Seriously SUCH a genius idea to take all the best parts about stuffed peppers and jam 'em into one awesome casserole! This looks so cozy and extra-comforting, Gayle! This makes the best comfort meal, Sarah! :) Thanks! Yummy I'm cooking this tomorrow!!! I hope you love this if you try it, Vivarais! Thanks for stopping by! Oh I love this idea!! I love stuffed peppers but rarely make them. This is such a great alternative! This looks and sounds great. I love stuffed peppers and all the ingredients listed above so I definitely want to try this! You would love this dish, Kerri! It's delicious and so easy to make! Thanks for stopping by! This is perfect for the colder weather we are having right now!Love stuffed peppers, but we almost never eat the peppers, just the stuffing :) Will definitely try the recipe! 30 minute meals are my favorite! What a great idea! I love this idea! As much as I love stuffed peppers, they can be a bit time consuming, so this is brilliant! Definitely trying this out! Thanks, Michelle! Hope you love this if you try it! Love that you turned stuff peppers into an easy casserole dish! Oh I love stuffed peppers, Gayle. And "unstuffing" them is such a great and fun idea. This looks really comforting and I want to gobble up the whole pan! Two things my boyfriend always asks me to cook more of - peppers and beef! I'll have to add this to the list! Sounds like your boyfriend would love this, Dani! 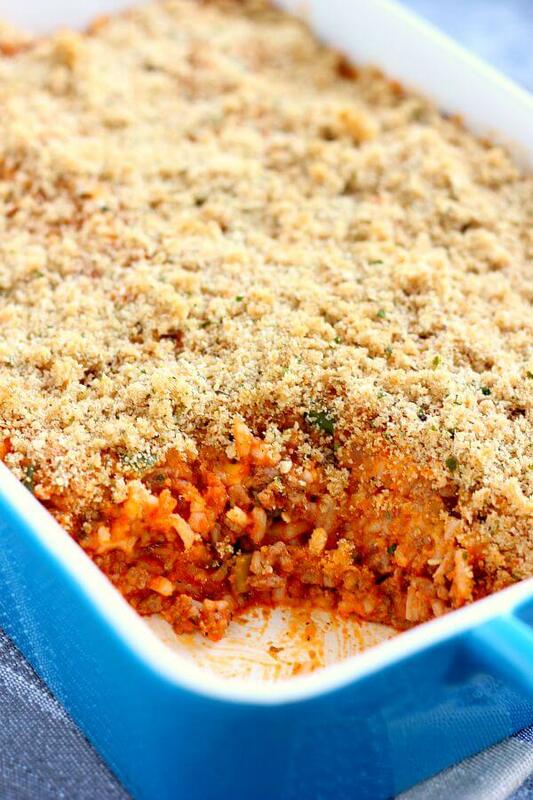 This is a great idea taking all of the goodness of stuffed peppers and making it into a casserole! I love stuffed peppers, so I definitely need to try this! 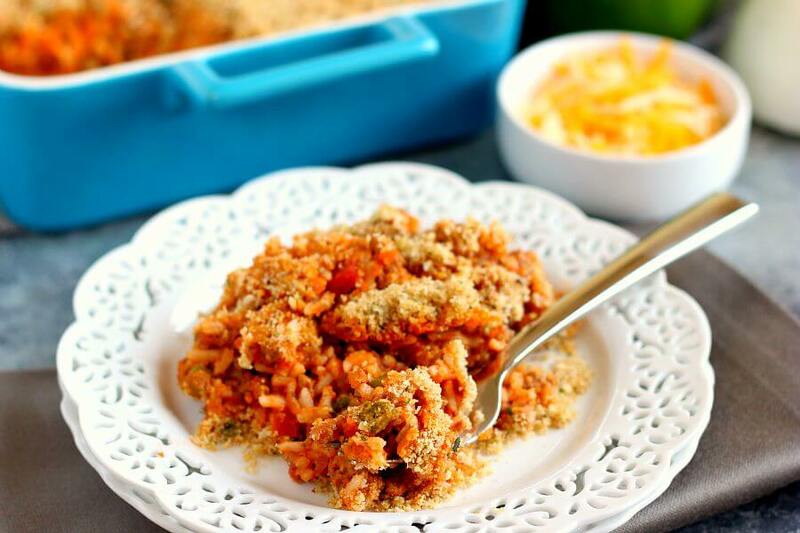 Stuffed pepper casserole is such a favorite of ours so I loved the spin you put on yours. I never do bread crumbs on top so I can't wait to try that. Thank you! Thanks, Pamela! 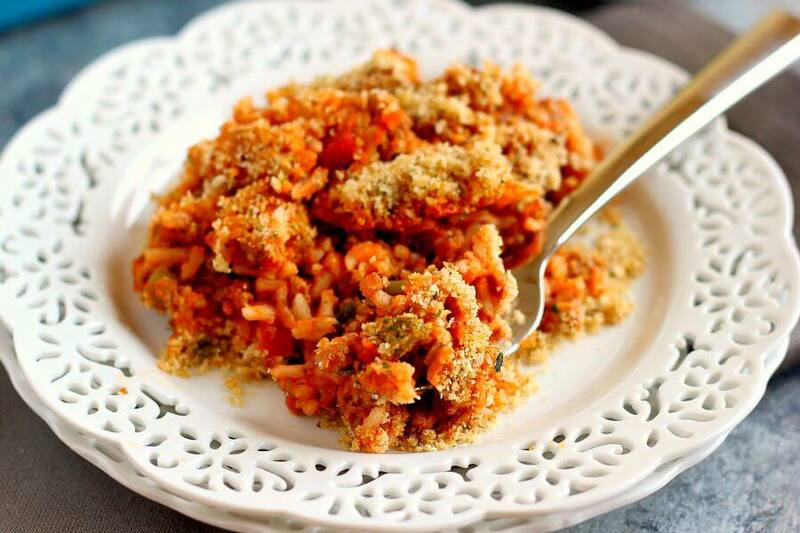 The breadcrumbs add the perfect touch! I love stuffed peppers but don't make them often because of the amount of work involved. 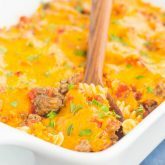 Love love love this comforting and delicious casserole version. So much easier and even more fabulous! I love this idea! The filling in stuffed peppers is so delicious. And my dang peppers usually tip over and spill out when I eat them anyway. This is great! This is such a great idea, Gayle! The stuffing is always the best part! And I think my husband would love this because he never really liked the pepper part, haha! I agree, the stuffing is definitely the best part! :) Thanks, Izzy! Thanks for the kind words and pin, Senika! I love the time saving idea of unstuffing the stuffed pepper! 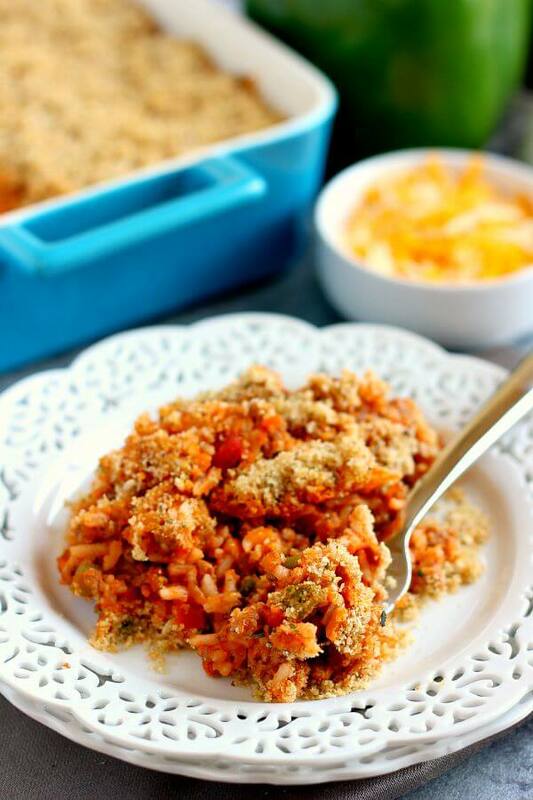 This is a perfect comfort food for an easy weeknight meal! I love stuffed peppers, but they tend to take a long time to make. This totally solves that! This is such a fantastic idea, Gayle! Haha oh man, I guess your husband learned his lesson! :) Thanks for the kind words, Michelle! I love the name! Makes total sense now :D Looks so delicious, Gayle, I am definitely craving comfort food these days! I love stuffed peppers! This looks so easy and still hearty and perfect for fall -- definitely saving for later! Isn't it the best when delicious things are also time-saving things? This is creative on top of creative - and going onto my list of Thanksgiving ideas!! Thank you, Kate! 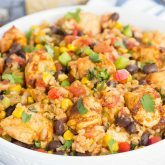 It's a favorite weeknight meal of mine! Gayle, I saw this over social media and forgot to hop over yesterday! 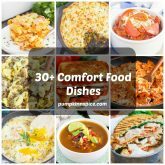 I love these 30 min Thursday recipes!!! and LOVE that you re-invented the stuffed bell pepper!!! Brilliant! I love casseroles in the fall and winter!!! love this! Thanks so much for the kind words, Alice! I agree, casseroles are the best in the fall and winter! What a fun idea, especially for kids! They never eat the outside pepper, just the filling! Yes! I'm sure kids would love this more than regular stuffed peppers. Thanks, Kelly! This is such a smart idea Gayle!! Love how quick and easy this is! I love this! So creative. I'm a fan of stuffed peppers - but I'd much prefer the flavors as a casserole. I look forward to all of your 30 minute meals, my friend! Not going to lie that I kinda sorta love the name of this dish! We love stuffed peppers at our house but they can be too time consuming sometimes... this sounds perfect! My husband makes dinner every once in a while too, and it's so nice to have a night off from cooking! Although he's really good about doing dish duty every night. :) I love stuffed peppers but they do take some effort, so I love that you've made them unstuffed and easier! I thought it was odd not cooking the rice first haha. I have three little ones. My youngest is 2 months and he likes to cry when I'm not holding him. So I get frazzled sometimes.. I added some water and put it back in the oven. It was good but I'll do it right next time. Can't wait to try is again the right way! I totally understand! Cooking can be such a task with kids sometimes, especially when they need to be held! :) Hopefully it will turn out a little better for you next time. I just made this dish last week (for the millionth time) and it's one of my favorites! :) Have a great day, Leanne!